The World of Gord: Beer of the Week - Boris Beer by Brasserie de Saverne S.A.
Beer of the Week - Boris Beer by Brasserie de Saverne S.A. When I think of France and of Alsace, I think of wine not beer. Two summers ago I was fencing in the Commonwealth Veteran Fencing Championships in the Channel Islands. I took a trip over to St Malo, France, to look around the famed walled city. When thirsty I would stop for a glass of French wine then continue on my way. Finally I decided to try a French beer and inquired at three different places only to be told they did not have any. So I settled on an overpriced bottle of Stella, far from a French beer experience. After I wondered if there were any distinct French breweries. This past week Teena came home from the LCBO with 2 cans of Boris Beer by Brasserie de Saverne S.A or Saverne Brewery. So there is French beer! 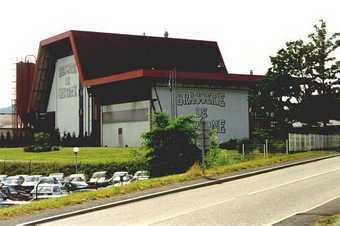 Saverne Brewery was founded in 1845 in the Town of Saverne in Alsace France. It ran as an independent brewery up until 1989 when it was sold to Karlsbräu, a German Brewery company. "The Saverne brewery of Karlsbräu France is a unique production facility, nestling among vineyards and woodland in a small fortified town in Northern Alsace. This bridgehead plant upholds the great brewing tradition of Alsace, which finds a natural expression in the beer brewed in the Saverne brewery." It pours a light straw colour which is quite easily to see through. It had a white head which disappeared quickly. There are lacings left along the side of the glass but very thin. There is very little aroma. As for the taste, there is very little. It starts slightly spur and finishes with a stronger sourness. Not much to this beer. I imagine there are some better French beers out there. I sure would hope so. Have u discovered Kronenbourg 1664? Available at LCBO and much more expensive than Boris.